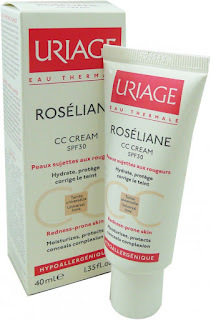 Tomas from Conefreys kindly sent me the Special Duo pack of the Roséliane Dermo Cleansing Fluid and the Roséliane CC Cream. As someone who has some underlying sensitivity I was very excited to see these as I am forever trying to conceal my rosacea. Roséliane Dermo-Cleansing Fluid: I normally use cleansing balms/oils so was unsure how my skin would react to using a cleansing lotion. It is described as a make-up remover and cleanser, but I found that I had to use a lot of product to thoroughly remove my make-up so my preferred way to use it after my oil/balm cleanser to double cleanse at night, and as a morning cleanser and I have used it in this way for the past four weeks. The lotion is a creamy texture and has a lightly floral scent (it contains mallow, calendula, rose and apricot kernel oil as well as uriage thermal water) and it feels very refreshing on the skin. The Rose is excellent for soothing sensitive skin, and the apricot kernel oil will hydrate the skin. It cleanses without stripping the skin and didn't leave any residue. My skin felt soft to touch after using this and didn't react adversely at all over the four weeks. It is priced at €20.50 for 250ml, which would last a good few months as I have used less than 20% over the last four weeks. It can also be got in the duo pack for €21. Evens out skin tone and illuminates the complexion. The mineral pigments instantly correct redness, as well as a dull and uneven complexion. Conceals redness. The TLR2-Regul complex works synergistically with ginseng and red algae extracts to regulate immune pathways and strengthen blood vessel walls. Provides lasting moisture-replenishment. 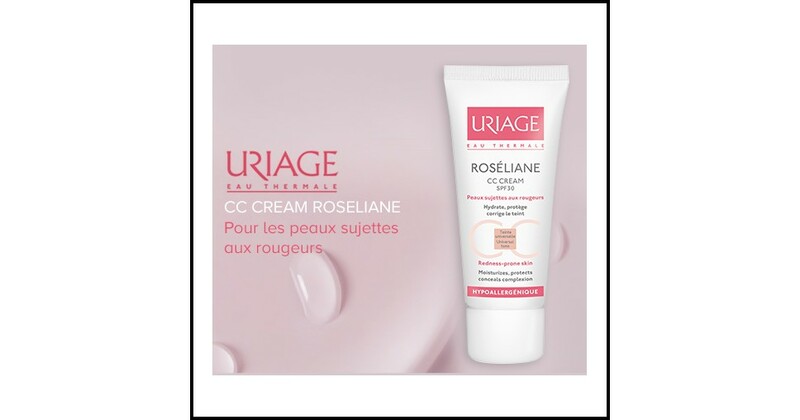 Rich in Uriage Thermal Water with moisturizing and soothing properties, this cream hydrates and provides immediate and long-lasting skin comfort. Protects skin from UVA/ UVB light. The high tolerance sun filter blocks UVA-UVB rays. Roséliane CC Cream: A rich and non-greasy cream that provides the combination of skincare and makeup coverage for rapid application and a perfectly sheer finish. It conceals redness, evens out skin tone and adds radiance to the complexion, while offering protection against UV light, thanks to its SPF30. Upon application, comfort is immediately restored to skin, leaving it soft, perfectly moisturized and soothed. This claims to moisturise, protect and conceal and it contains SPF 30 and it comes in one universal shade. The CC cream is definitely moisturising and doesn't cling to any dry patches or oxidise on the skin. 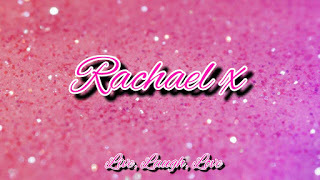 It offers light coverage, is perfect for minimal make-up days and has a satin finish but doesn't look greasy. Without primer, it needs touching up after 4-5 hours so not the most long-lasting, but a little spritz of thermal water as a primer, or a silicone primer and it holds up wonderfully. It is perfect for no makeup days or for summer days when it is hot and humid. It is priced at €20.50 for 40ml. Again it can be got in the duo pack for €21. Below is a before and after of me using the CC Cream. I love the effect of the cc cream and the look it gives to the skin. I have a natural glow while it looks like my skin is the one tone. I definetley recommend this product to anyone who is in the market for a cc cream or for a cream to even out skin tone and redness.